First off, I am not a big fan of Halloween. I was the kid crying in the corner and NOT trick-or-treating. Fortunately, I grew up. 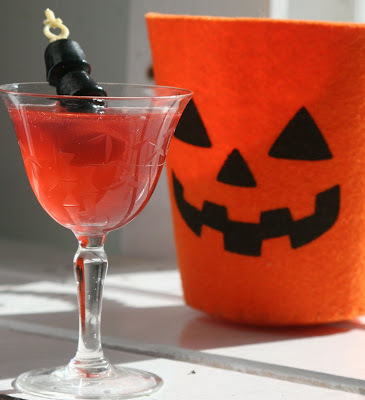 Instead of candy I can drink -- which makes Halloween much nicer. Today's Halloween Cocktail at the Burn Pit is just right for a nice evening in with the lights way down low, so no one comes a-knockin'. One of my favorite candy treats (which I never got on Halloween) is a box of Crows. Crows are the liquorish equivalent of Dots. For Halloween, they make Blood Orange Dots. When I was at the beach a while back, we went to the Dogfish Head Brewery for lunch and I picked up some Blue Hen Vodka that had been flavored with Blood Orange. Add to that a large bottle of Italian Blood Orange soda and I feel a drink coming on. Take a small glass and add 4 dashes of orange bitter and swirl to coat the glass. Mix 1 ounce blood orange vodka and 1 ounce blood orange soda. Garnish with blood orange Dots. A couple of these and I might just enjoy Halloween.